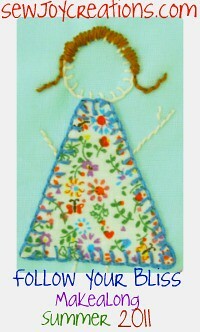 Sew Joy: Drowning in my Lady of the Lake - Quilt Along, Anyone? Drowning in my Lady of the Lake - Quilt Along, Anyone? Okay, maybe I shouldn't be so dramatic. I am so close to a finish. Some of my friends over at Pat Sloan's Quilt Mashup Forum even made blocks for me. Enough that I will have another row in my quilt. Enough so that I didn't have to do much at all to get this 11 year project that much closer to completion. Enough so that I only had to make a few half square triangles to put this set of blocks together. I have one more set of blocks to put together. I have 2 rows of panels completely quilted and joined together. A third is almost ready. The fourth is almost ready to be basted. The fifth is waiting in the wings. I am cheering myself on with this post. So many ideas are trying not so patiently to take me away from this project - again. - almost a challenge/artsy quilt along. But-the-ideas-are- flowing-so-fast-that- I -have-nothing- to-really-show-you. I just wanted to tell you that I'm excited about it! That quilt is going to be beautiful! I'm sorry I can't join the quilt along. I can't let myself commit to one more thing until I get some project finished. I've feeling a bit overwhelmed at the moment! Of course, once you show the design I'll probably be right there in the middle of it. oh, my!! This is growing so beautifully. I don't know when I can join a QAL because I have to finish 3 more UFO projects before I can start anything new. I can tell you that I sure would WANT to!! Your Lady of the Lake quilt is going to be stunning. As for your QAL idea, I'm intrigued and want to hear more. Sarah, what a fabulous photo of your LotL spread out - is it your porch? It's going to be a real winner!!! Love it!!! It's going to be Beautiful!!! That one is gorgeous, can't wait to see the finished quilt. Are you planning a QAL, like this quilt??? Or something else? I love the look of your quilt - its gonna be well worth the wait - you'll see!!! I love your LOTL and yes, I am also interested in a QAL. Beautiful Sarah! A QAL sounds fun. Oh WOW Sarah...that quilt is awesome!! 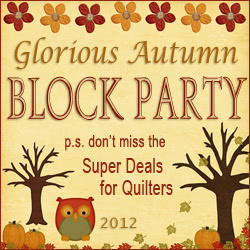 I really like quilt alongs...in fact I am doing one this month with Rachel of psiquilt. She is getting more beautiful everytime you show her! Just love your layout. A quilt along?!! Now I'm asking YOU (like we ask Pat), do you ever sleep?